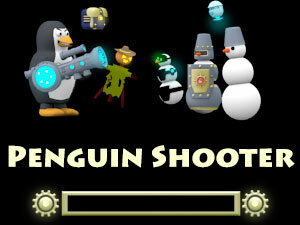 Home / Online games / Games Shooting / Game "Penguin Shooter"
Shoot at enemies and destroy all of them. But play quickly and accurately that any bullet didn't fly past, and your weapon can overheat so on the account each shot. Remember, enemies don't doze and constantly improve the protection and methods of the attack. Be ready to everything in this free online game! It is not just online shooter game, and the whole RPG game: you can earn on new weapon, improve protection and receive many other pleasant bonuses.